All major & minor plumbing installations and repairs. Residential and commercial. Licensed and insured for your protection. In general, plumbing issues are often serviced by companies in and around the DFW metro area. 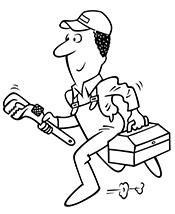 Road Runner Plumbing Services is the premiere choice for YOUR plumbing service and repair needs. In your search for a trusted Fort Worth plumber, know that Road Runner Plumbing Services has over 10+ years of experience in the industry and highly trained technicians. We’re able to offer residents of the Fort Worth area high quality plumbing services meeting the most rigorous of plumbing standards. We’re pleased to be a leader in the Fort Worth area, and we’ve worked hard to maintain an excellent reputation in the community. Road Runner offers clients a variety of service options to make a repair or installation as easy as possible. We begin with a 24-hour emergency response service, which ensures that clients will have the best help in the business as quickly as possible. With a fleet of radio-dispatched trucks in the Fort Worth area, we’re able to effectively coordinate service and repair jobs, and get our clients help as soon as they need it. In addition, our services are offered on weekends and holidays for those times that plumbing refuses to cooperate or that a severe storm or weather issue knocks a system offline. At Road Runner Plumbing Services, we are dedicated to the details when it comes to properly fixing sewer lines, rerouting water pipes, repairing slab leaks, or installing a new system. Our professional technicians have the training and experience necessary to make sure that each job is handled with care and that each part used is not only correct, but of the highest quality. Each job is unique, and we approach each as a challenge and a way to test our plumbing mettle and to deliver a quality experience for customers. We’re the obvious choice for any plumbing needs in greater Fort Worth area. With our stellar service and prices combined with our dedication to quality and speed, we’ve gained a reputation in the industry and the community as one of the best in the business. Contact us today and see how Road Runner Plumbing Services can help your home or business to keep the water flowing and keep your household or business plumbing systems running smoothly!